Description: The carapace and legs are orange brown. Eyes of subequal size, the anterior medials close together, the lateral eyes touching. The abdomen is yellow brown to grey, dorsum sometimes with greyish bars. TM I 0.74-0.80 (van Helsdingen 1974). Leg IV longer than leg I in both sexes. Spination of tibiae distinctly different from the other species of the genus (van Helsdingen 1974). In addition to the principal trichobothria there is a series of 2-3 shorter trichobothria on all metatarsi (not present in other species). The male palp is provided with a number of closely grouped stout spines easily visible with a lens. The female epigyne is also characteristic and consists of a large triangular sclerotized projection intermediate in size compared to the smaller one of A. vidua and the larger one of A. dentisetis. Size: Female 4-5.5 mm; male 4-4.5 mm. Genus: Allomengea Strand, 1912. Characters of genus: Small to medium-sized spiders with European species ranging from 2.9-5.6 mm in body length (van Helsdingen 1974). Carapace not modified in males. Eyes subequal with anterior medials slightly smaller than the others. Chelicerae with well-developed stridulating ridges. Abdomen with or without a pattern. Legs long and thin. Femora without spines, tibia with several spines including ventral ones, metatarsi I and II with one ventral spine only (occasionally none), metatarsi III and IV with more numerous spines. Tm I 0.65-0.80. Metatarsi IV with a trichobothrium (A. scopigera has several trichobothria in addition to principal one). The males of the genus are easily recognized by the palp, which is armed with a bunch of stout spines arising from the tip of a horn-like projection of the cymbium. Epigyne is formed as a small to large more or less triangular sclerotized projection depending on species. 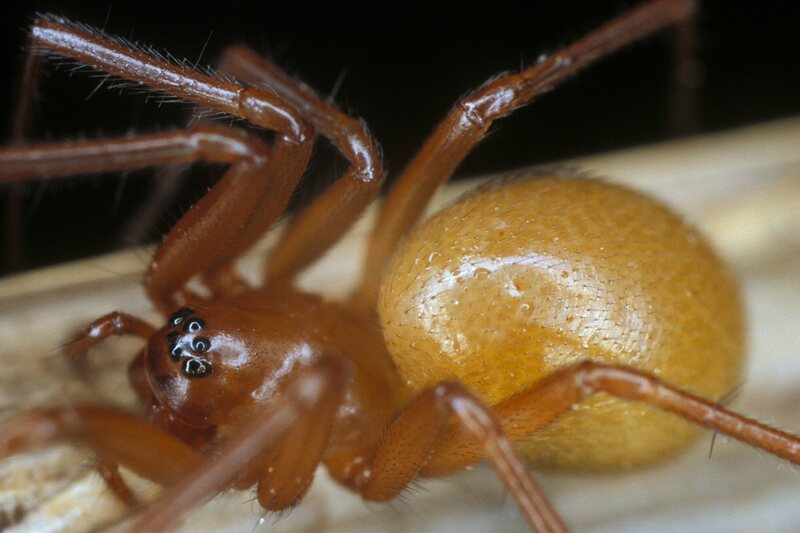 Family: Linyphiidae Blackwall, 1859 (Line Weaving Spiders). Characters of family: The linyphiids belong to the group of ecribellate spider families having 8 eyes and 3 tarsal claws. The eyes are arranged in 2 rows of 4, usually heterogeneous in size with the anterior medials smaller than the rest. Frequently, the eyes are ringed with black, this being most noticeable in species with lighter coloured carapaces such as many species of the Linyphiinae subfamily. Some species adapted to dark habitats have the eyes much reduced, sometimes being very minute in size or only evidenced by pale markings under the integument (e.g. Porrhomma rosenhauri). The carapace is highly variable especially in the smaller species belonging to the Erigoninae subfamily. Males of this large subfamily frequently have the frontal region modified into strangely formed lobes or bear other types of protuberances some of which may have tufts of hairs. Some species have the carapace punctured with pits (see images of Lophomma punctatum). The males may also have sulci (grooves) running backwards from the posterior eyes. The chelicerae do not possess a lateral condyle (boss at base of chelicer). The outer side of the chelicerae have horizontal stridulating ridges visible in many species. Such ridges only occur scattered in other spider families (see for example images of ridges in Metellina stridulans of the Tetragnathidae). The labium is strongly rebordered as in the Nesticidae, Araneidae, and Tetragnathidae. The endites are usually parallel. Legs are slender and provided with spines. The number of spines on the legs is an important character for species identification when this is undertaken using the stereomicroscope. The abdomen is nearly always longer than wide sometimes with a pattern (Linyphiinae in particular) and sometimes mainly uniformly coloured, very often blackish (Erigoninae in particular). Some species posses an abdominal scutum as for example some members of the Ceratinella genus. The epigynes are variable, sometimes simple as in the Erigoninae or provided with a scapus as often seen in the Linyphiinae. The male palp often possesses an U-shaped paracymbium. The family was earlier divided in to two subfamilies, which sometimes were elevated to family status: the Linyphiidae and Erigonidae (also known as Micryphantidae). The Linyphiidae was characterized by not having tibial apophyses on the male palp, by having a claw on the female palp in most species, and by having two dorsal spines on tibia IV or if only one spine present there was one short spine on metatarsi I and II. The Erigonidae was characterized by having at least one tibial apophyses on the male palp, by lacking a claw on the female palp, and by having just a single dorsal spine on tibia IV and with the metatarsi spineless, or all spines lacking altogether. However, the family is now divided in to seven subfamilies, the Dubiaraneinae, Erigoninae, Ipainae, Linyphiinae, Micronetinae, Mynogleninae, and Stemonyphantinae. Consult recent literature or Wikipedia for lists of subfamily genera. 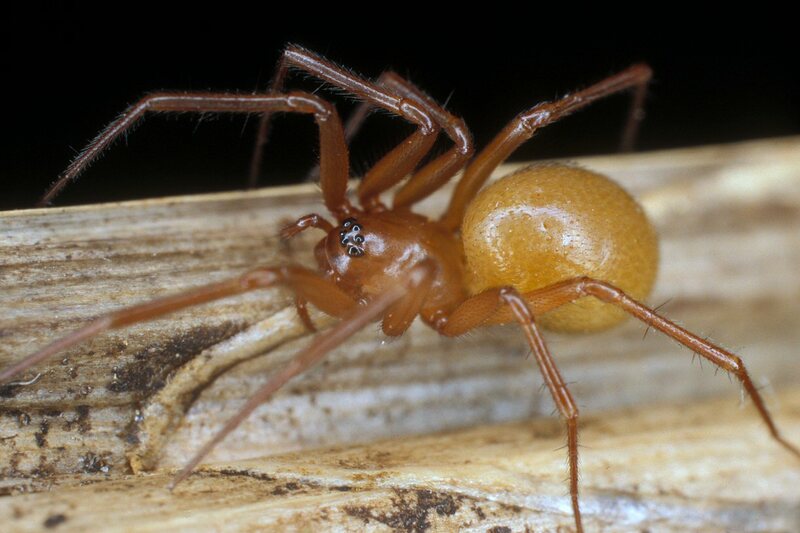 See also Linyphiid Spiders Of The World by Andrei Tanasevitch and LinyGen: Linyphioid Genera of the World (Pimoidae and Linyphiidae) by Gustavo Hormiga, Dimitar Dimitrov, Jeremy A. Miller and Fernando Alvarez-Padilla.